More than 170 learning assistance leaders from 18 community colleges and 2 California state universities gathered at Merced Community College on March 23, 2018 for the third annual Northern California Tutor Expo, the flagship event of 3CSN’s Learning Assistance Project. The sold-out program, titled “Cheers for Peers,” was the largest turnout yet for the annual spring conference that is a celebration of student leaders and other learning assistance educators. The morning plenary featured UC Merced student Maricela Martinez, who delivered a heartfelt keynote address called “Learning My Own Lesson: How Becoming a Tutor Taught Me the Lesson of Self-Worth,” and was followed by a student panel discussion on peer mentoring featuring Raul Mendoza, Kody Huntington, Anore Barrera, and Aysia James of Merced College, and Jason Casio of Los Angeles Peirce College. Student-led breakout sessions covered a wide variety of topics, including building diversity, community, and empathy in tutoring sessions, supporting ESL and bilinguals students, working with adult learners, and applying Growth Mindset to help students succeed. 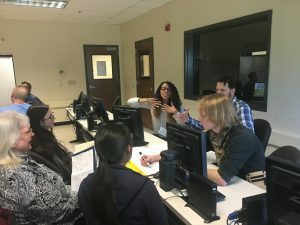 “I thought this tutoring expo was really mast because it was so student focused,” said Trillian Donahue, a graduate student in English Literature at San Francisco State and a tutor at Skyline College’s Learning Assistance Center. An emergent theme of the day was how diversity and equity are things to be embraced, rather than ignored, in creating powerful learning environments. Many participants also commented on the camaraderie that was developed by participating in Tutor Expo with their campus peers, and connecting with new ones from all over the state. Participant feedback: What helped support your learning today? Participating Colleges: City College San Francisco, College of the Sequoias, Columbia College, Gavilan College, L.A. Pierce College, Los Medanos College, Merced College, Merritt College, Mission College, Modesto Junior College, Pasadena City College, Sacramento City College, San Joaquin Delta College, Shasta College, Skyline College, Solano Community College, West Hills Coalinga, West Hills Lemoore, San Jose State University, California State University Monterey Bay.